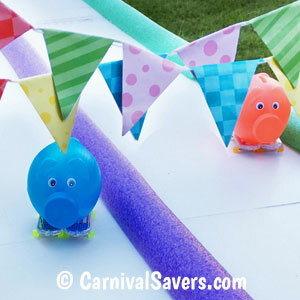 DIY School Carnival Game Idea - Pig Races! Add Mini Flags to Finish Line for More Fun! Glue 2 Plastic Skateboards on each Pig. Box or other support to give the board approximately 18 inch lift at the starting line. First, you make the board by using hot glue to seam the science boards together. We did this by gluing the fence pickets to the underside of the white boards for support and it allowed us to seam the science boards at the same time. 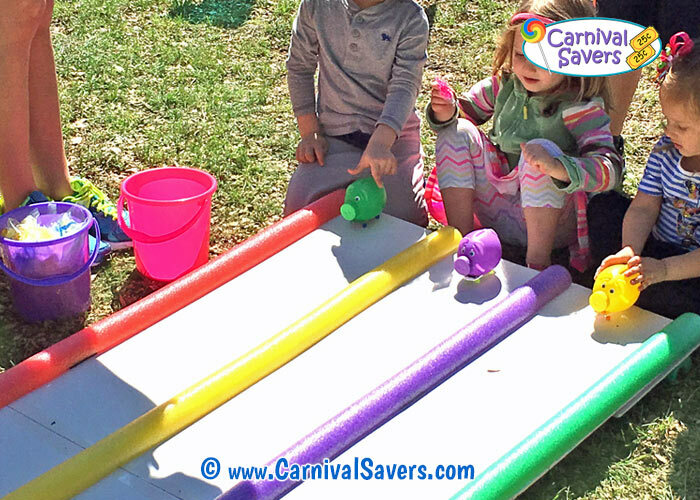 Next, cut your pool noodles in half lengthwise and glue those those to the top of your game to make race lanes as shown in our image above. Before the carnival, set up your game board. *We prefer the table top design because when we had the game on the grass, kids were tempted to lean on the board and because the board is a little delicate, it may not last long if the kids are putting pressure on the board itself. Also, you will need to have some type of empty box or other support to lift the board up at the starting line so the pigs roll to the finish line. Players choose their favorite color pig. Players are told that in this Pig Races game, the goal is to get your pig to go the FARTHEST NOT THE FASTEST to win. "So do not push your Pig, just let go and let it roll straight down the lane to win!" We found it was best to let kids have one practice round, so they could see that it was best just to keep the pig straight in the lane to win the game. After the practice run, say "Mark, Set LET Go!" and see which pig rolls the farthest. If 2 or more pigs go the same distance, you can have those players do a tiebreaker race to see who the final winner is. Very young children (ages 2 - 4) sometimes had trouble understanding not to give their pigs a push, just let go and they roll down the board. 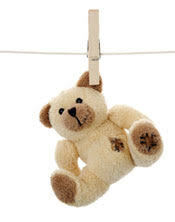 So, if your carnival is solely for younger children, this may not be the best game for that age. The tilt of the board is very important, too much tilt and the pigs go too fast and do not stay straight. Too little, and they stop. We found about 12 - 18 inch lift at the starting line was working pretty well! **About the prizes, because there will always be a winner, make sure your Winner's Prize is more like a "medium prize" (maybe worth 35 - 50 cents). If you want to make this game more exciting, have a handful of nicer Prizes (like small stuffed animal pigs), and let all the winners put their name in a jar. At the end of the carnival, you can do a drawing for the handful of Grand Prize Winners of the Pig Races! 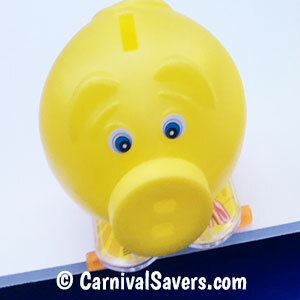 GRAB THESE PIG RACES SUPPLIES & CARNIVAL PRIZE IDEAS!